were reproductions of famous naval battles and were staged in a suitable place, that could be flooded. The actors were generally criminals already condemned to death. 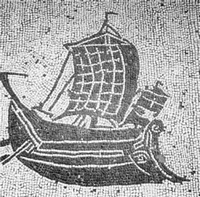 These shows - which were apparently held only in the city of Rome - were extremely expensive, because the ships had to be complete in all their details and manoeuvred like real ships in battle. 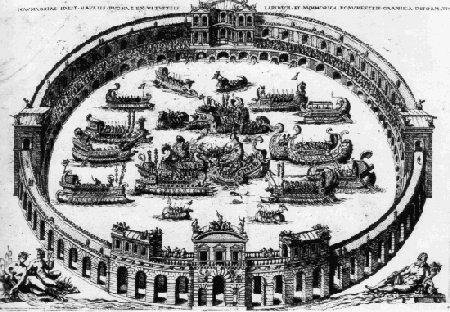 The Romans called these shows navalia proelia (naval battles), but they are commonly known by the equivalent Greek term naumachia, which came to indicate at the same time the show and the basin built for it. The naumachiae often wanted to reproduce famous historical battles, like the Greeks winning at Salamina against the Persians, or the Corcyreans destroying the Corinthian fleet. The shows must have been imposing: in one naumachia a fortress was built in the middle of the basin so that the "Athenians" could land and take the "Syracusan" stronghold. The original phases of the battle had to be followed, and the public was thrilled to see the skill of the soldiers and the war apparels. Criminals were set to fight one another; but sometimes there were troupes, like in a historical pageant, and sometimes real sailors and soldiers. Martial tells us that in the Colosseum naumachiae were staged in the first years after the inauguration, but modern archaeologists (Lugli, The Flavian Amphitheatre) state that they were later abandoned, because "a great deal of preparation was necessary to make the arena watertight to a sufficient depth (about 5' or 1.5 m) to float the ship". One can wonder how the openings could have been closed in order to flood the Colosseum, and this led some archaeologist to think that the underground of the arena was excavated only some years after the inauguration, under Domitian. 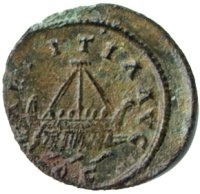 The first naumachia was financed by Julius Caesar to celebrate his triumph in Egypt. It was held in Rome, in a temporary basin excavated in the Campus Martis, and it recreated a fake battle between Egyptians and Phoenicians. 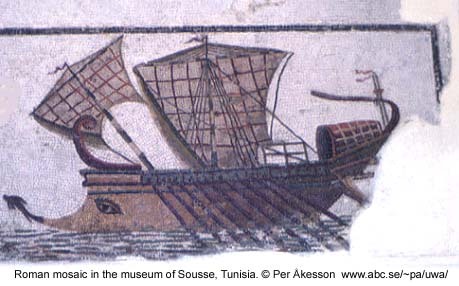 The Romans enjoyed the show immensely, therefore Augustus organized more naval battles in the Septa, a monumental complex with an open space of 300 x 120 metres, surrounded by porticoes and decorated with works of art from all the conquered countries. 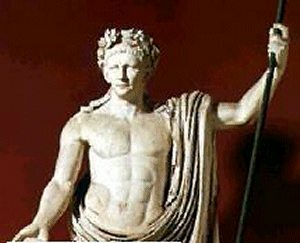 It os obvious that Augustus would like to celebrate the Roman navy, because his supremacy depended upon the victory in a naval battle at Actium, where the admiral was his son in law Agrippa. 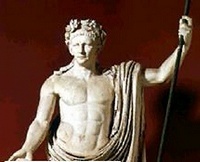 In Rome, Augustus and Domitian had basins excavated only for the naumachiae. Augustus' basin measured 598 by 393 yards, and an aqueduct 22,000 paces long was constructed in order to bring the water from the lake today called Martignano, near the lake of Bracciano. Thirty ships and three thousand men participated in the inauguration of Augustus' naumachia, that was still in use at the time of Nero and Titus. Later Domitian built another naumachia, whose exact location is still a mystery. Claudius had a naumachia in 52 AD on the Fucino lake, in central Italy, for the inauguration of the drainage tunnel of the lake, that drove its waters to the nearby valley through a mountain. It was a very impressive feat of engineering, that worked until the IV century AD (the lake was drained again only in the 19th century). In that naumachia rafts full of praetorians were set all around the action, to prevent escape. 19.000 gladiators made the show, and an immense crowd congregated on the mountains around to watch. On that occasion - but it doesn't seem to have been very common - mercy was promised to the survivors.